By the time it’s 2012, less than 3 months from now, Thomas “Hitman” Hearns, an eight time world champion in six different weight divisions, will be inducted into the Boxing Hall of Fame in his first year of eligibility. The first fighter to win titles in four and five different divisions, Hearns was part of the legendary foursome that pretty much defined boxing in the 1980’s through Welterweight and Middleweight – Sugar Ray Leonard, Marvin Hagler and Roberto Duran. The most famous fight has to be the one against Marvin Hagler. The War, they call it. Only three rounds, but the best three rounds of boxing you’ll ever get to see. Hearns broke his right hand in the first round, but opened up a big cut over Hagler’s nose, which almost stopped the fight. The doctor eventually allowed Hagler to continue, and by the third round, it was Halger’s. Hearns did manage to keep going, but a grave mistake of turning his back on Hagler meant the knockout. Against Sugar Ray Leonard, Thomas Hearns fought twice. The first fight, in 1981, is called The Showdown. It was Hearns’ first loss, coming in the 14th round, and also, like the Hagler fight, is an all-time classic. 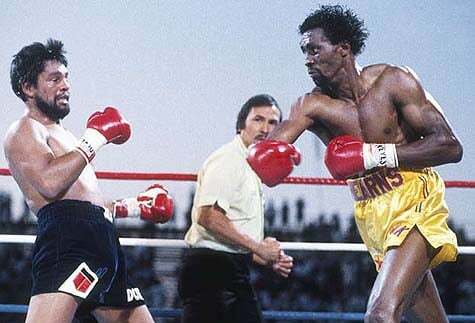 Hearns was leading the scorecards, but the ref stopped the fight after Leonard was destroying him on the ropes. But Hearns had to win one of the super fights – He beat Roberto Duran in 1984, becoming the first fighter to knock the Panamianian out with a vicious hit in the second round. This was before the Marvin Hagler fight, mind you, before that fight changed Hearns’ style which was very reliant on power, unmatched in the divisions he fought in.